Most research on virtual communities focuses on internal community structure and dynamics. How best to design a community, which technologies to use, and what participant roles are needed, are some of the dominant research questions. However, what is still very much understudied is the societal role of virtual communities. 'Wicked problems' are complex, situated, and interrelated problems that have no single solution, like many environmental conflicts. Currently, public discourse on their resolution mostly takes place either in official fora in which government, corporations and selected non-governmental organizations (NGOs) negiotiate, or in the mass media. However, the quality of societal discourse can be much improved by, in addition, having carefully designed Internet fora. To stress their public media role, I call them intermedia: those Internet technologies that are used to facilitate societal discourse. One example of Intermedia is the GRASS (Group Report Authoring Support System), in which we try to combine theoretical principles on civil society with practical systems design (Heng and De Moor, 2003; De Moor, 2004). They allow for more intensive participation by a greater number and diversity of stakeholders than before. Decision makers can also get better feedback on decisions, not only in the form of hearings at the beginning and end of an official process, but also on different intermediate deliverables of finer granularity during the process. Another very important role is that the effects of the implementation of public decisions can be monitored much more easily, as information preceding the decisions, as well as relevant actors, are much better accessible to affected parties who signal deviations from the agreed policies. Because intermedia enable the creation of tailor-made communication fora, trust building between adversaries can be facilitated. I am particularly interested in stakeholder communities working on societal conflict resolution. In these communities, people representing different stakeholders use intermedia to conduct public discourse to assess the amount of consensus on wicked problems. Stakeholder communities and intermedia are mutually dependent: no medium is useful without an active community that benefits from it, while, in turn, intermedia can help build communities by giving them a focused forum to define the issues and relations that bind their members. What exactly these interdependencies are, is still an open question. - A. de Moor (2004). 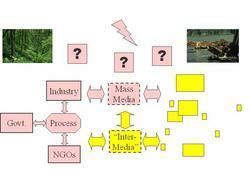 Strengthening Civil Society by Developing Stakeholder Communities Using Intermedia. In Proc. of the Building & Bridging Community Networks: Knowledge, Innovation & Diversity through Communication Conference, Brighton, March 31-April 2. - M. Heng and A. de Moor (2003). From Habermas's Communicative Theory to Practice on the Internet. Information Systems Journal, 13(4):331-352.